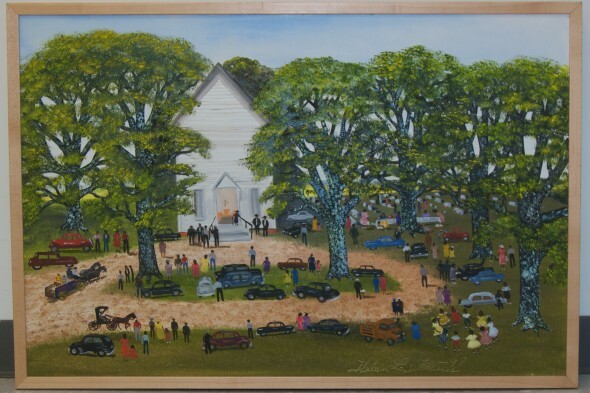 In 1995, I had the pleasure of being introduced to self-taught Southern artist Helen LaFrance. An accomplished painter, quilter, wood carver, and Biblical interpreter, Helen LaFrance also has an exceptional ability to connect with the viewer emotionally through the memories they share. She paints scenes of a time and place that many recall but others respond to as well. On canvas, she transcribes the values and traditions she grew up with, the concept of family and church, the strong work ethic that was her model. These paintings fall into a category of American folk art known as memory painting. And memories, as we all know, give meaning to our own lives and to the lives of others when we share them. Lee Kogan, Curator Emerita, American Folk Art Museum in New York, places the artist in excellent company. 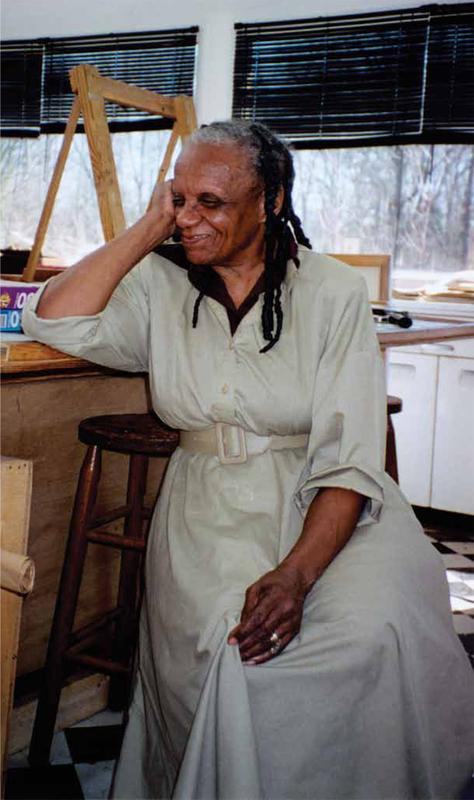 She explains how LaFrance’s adventurous spirit and technical skill recall the art of other twentieth-century self-taught American artists like Grandma Moses, Clementine Hunter, and Nellie Mae Rowe, all primarily painters who worked in other media as well. The artist grew up the second of four girls on her family’s farm. Though African American, her father was not a sharecropper. He owned his land. She picked cotton, hoed tobacco, chopped wood, and worked in the chicken house. She has fond memories of her childhood. Perhaps that is why she is so good at capturing what life was like. Her parents bought schoolbooks in town and taught her at home. After her work and lessons were finished, she could do what she wanted . . . and that was to draw. She was inspired and nurtured by her mother. They made colors from dandelions, walnut bark, berries, and bluing. She painted on large tablets and leftover wallpaper. She went to school for a few years and got as far as eighth grade but then returned to work on the farm. She was 10 years old when the stock market crashed. At the end of World War II, she was 27. She was 50 years old in 1969 during the Vietnam War. She witnessed the Great Depression and segregation, and today she is still alive, with a sound mind, a quiet wry wit, and a paintbrush in her hand. Her circumstances had changed, of course, but Helen LaFrance looked no different than she did when I first met her almost twenty years ago, in the studio on her property down the road from where she grew up. She was still painting. Kathy Moses Shelton is the author of Outsider Art of the South and the recently published Helen LaFrance: Folk Art Memories available at www.just-looking-antiques.com and locally at Parnassus Books.